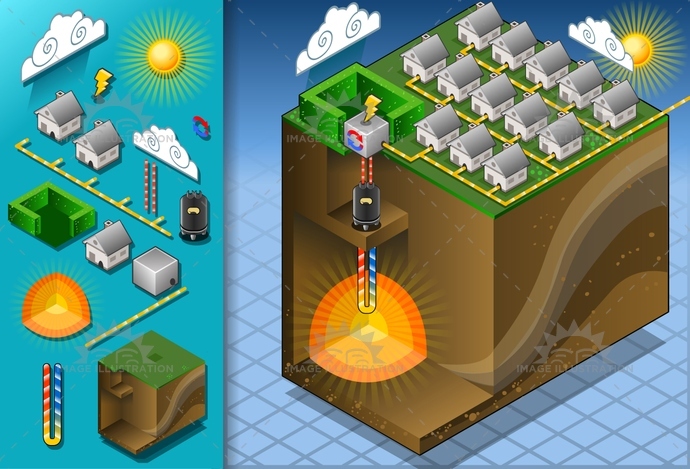 Stock product - detailed vector illustration - Isometric Building Collection - Geothermal 03 - created by Aurielaki. Image formats EPS AI JPG. SKU: Geothermal-03-Building-Isometric-AurielAki. Category: Energy Chain Set Vector 3D. Tags: alternative, burning, Concepts, Diagram, energy, environment, exchanger, fire, floor, fluid, gas, Geothermal, heat, heating, hot, house, isometric, lava, loop, magma, pipe, PowerStation, PowerSupply, pump, Refrigeration, Source, steam, technology, volcanic, water.